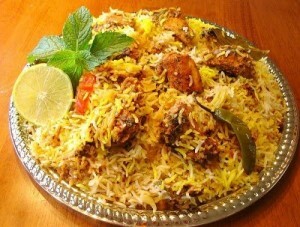 Bombay Biryani recipe by Nazia at DesiRecipes.com. Spicy, hot and zesty rice pilaf layered with lamb or chicken and potatoes. Marinate the meat in a mixture of the yogurt, ginger / garlic , all spice, salt , red chilly powder and dried plums for 2 hours. Heat 3/4 cup oil and fry the onions till they are light golden. Remove with a slotted spoon and set aside. In the same oil fry the potatoes, remove with a slotted spon and set aside. Put the meat with all the marinade in the same pan, cover and cook till the meat is tender. Stir and fry till the oil seperates. In another pot heat 2 tbsp Oil. Add the cummin seeds, cloves, rice, water and 1/2 of the fried onions. When the water dries, remove a little rice from the top and add the meat mixture. Sprinkle the coriander leaves and remaining fried onions on top. There are 7 comment(s) for this recipe. love the biryani rice so delicious.